Addressing challenges at the European Maritime Day: Reducing marine litter for the sake of the environment… and blue growth? The Horizon 2020 Capacity Building/Mediterranean Environment Programme in cooperation with Seas At Risk and Waste Free Oceans, within the framework of the European Maritime Day, held an event under the title “Reducing marine litter for the sake of the environment… and blue growth?” The event focused on the economic implications of marine litter and shedded ample light on the ways marine litter affects key sectors that rely on the marine environment. The event was supported by MIO-ECSDE and Region Västra Götaland. The European Maritime Day is celebrated every year in May, across the European Union to showcase the importance of the sea and oceans for our everyday life. This year, Gothenburg (Sweden) hosted the 5th edition of the European Maritime Day Conference where a great number of participants gathered to discuss the opportunities and challenges currently faced by maritime regions and sectors across Europe: from tourism and fisheries to maritime transport and climate change. The main focus of the conference was the theme of “Sustainable growth from the oceans, seas and the coasts”. The European Commission was the organizer of the event, with the government of Sweden, Region Västra Götaland and the City of Gothenburg acting as local partners. The event was a platform for dialogue offering the opportunity to a wide range of stakeholders, from policy makers to NGOs, industry representatives and local authorities, to exchange views and experiences on all related challenges, providing a holistic approach on the issue and focusing on an array of challenges relevant to the concept of ‘blue growth’. 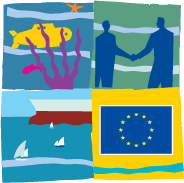 The event also aimed to outline the need for setting ambitious reduction targets by Member States by July 2012 under the Marine Strategy Framework Directive. Back-to-back with the European Maritime Day and within the framework of H2020 CB/MEP the Mediterranean Information Office for Environment, Culture and Sustainable Development (MIO-ECSDE) and ACR+, in collaboration with UNEP/MAP organized an intensive training on Minimizing Marine Litter in the Mediterranean, 21-23 May, 2012 with trainees from most Mediterranean countries (Read more here).